For internet protection, choose ESET, online at ESET.com. ESET offers antivirus software to protect your computer from internet threats, along with spyware and malware protection. ESET delivers protection for homes, small businesses, and medium businesses. Find software like Mobile Security, Smart Security, and NOD32 Antivirus at ESET. PC Gamers and Netbook users can feel secure with ESET’s software tailored especially for them. Stay connected and safe with ESET. For ESET coupons, ESET discounts, and ESET savings, check RetailSteal.com. ESET offers a 30-day return policy, but be sure to take advantage of the 30-day free trial before you purchase. 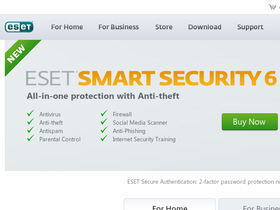 Act now and take advantage of a 25% discount on 2 years of Smart Security 5 software from ESET.com. Click link to save. Enjoy savings of 25% on 2 year license of ESET NOD32 Antivirus 5 from ESET.com. Click here to save. Save 20% on the Smart Security 4 Small Business Bundle only when you shop at ESET. At ESET, save 10% on renewals of ESET Smart Security. Click link for savings. Try ESET NOD32 Antivirus free for 30-days. Click link to start your free trial. Shop at ESET for security and enjoy free shipping on all orders. Click here to get started. Save 25% on ESET NOD32 Antivirus 6 when you click on this promo link. Click to save.